Chickens need to be tested for worms regularly. If there is a build up of worms in their digestive system that can cause health problems. Keeping chickens in a fixed area as so many of us do, where they are grazing the same piece of ground continually is the worst case scenario as they will be contaminating the ground and picking up worm eggs as they are feeding. Infected hens shed thousands of eggs in their faeces onto the ground and so, the problem gets worse. How can you tell if they need worming? By using a Worm Count Kit! 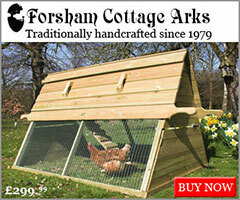 Using a kit means you’re not worming chickens unnecessarily. I use a product containing Flubendazole when necessary to worm my chickens. This is a proven chemical wormer that kill all common worms and their eggs in the chicken and is the only product licensed for use in chickens feed. 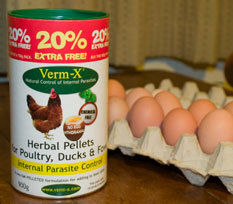 In between these times, I use Verm-X which has approval for use in Organic systems – now this is a herbal product which works in a different way – you will need to feed this to your hens every month for it to work. The really great thing about Verm-X is that being herbal, it contains many ingredients that are good for your birds so it can improve their overall health. Practising good husbandry techniques is key, in between worming chickens. We try to rotate our birds grazing area every month so that they get some fresh grass but so the ground also gets to rest (this is one of the major principles in Organic farming) and we keep the grass mowed short which allows the ultra-violet light from the sun to reach droppings and kill off worm eggs. 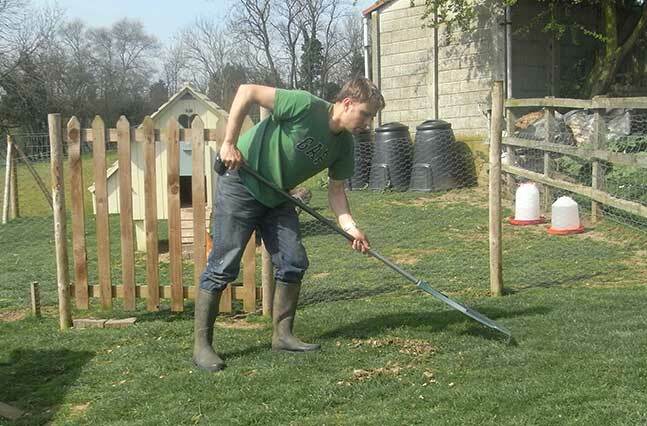 Cleaning a chicken run by raking droppings during dry weather. 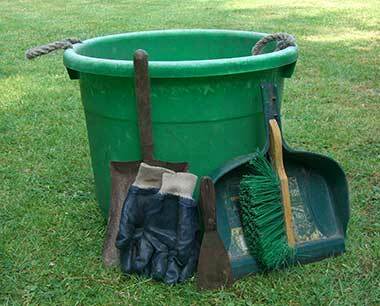 General cleanliness is of course important so if your chickens scratch around in their own droppings, you should be thinking about cleaning them up, rather than hitting them with a regular dose of chemicals. If you have a bad infestation of worms, you do need to keep in mind that eggs deposited on the ground will re-infect your birds and it is necessary to repeat the treatment before the eggs hatch and grow into adult worms to lay more eggs. This takes 3 weeks for most common worms carried by chickens so I would re-treat after 3 weeks if I suspect a particularly bad case of worms. Where external parasites are found on the bird (such as Northern fowl mite or lice) a systemic wormer / pour on product containing Ivermectin is useful. This kills a more limited range of worms. Victoria Roberts Diseases’s of Free Range Poultry says it excludes tapeworm and fluke, but these are less common in chickens. It isn’t licence for use on poultry so you would need to go to your vet for their advice. Please remember this should not replace the advice of a qualified veterinarian who can advise you about worming. Do you have any advice on worming? Please leave me a comment below. Hi I have wormed my 4 chickens using a 5kg bag of layers pellets with flubenvet and it was more than enough. I have some pellets left over and my birds loved it however they are used to eating pellets. Hi there! love this website so useful! Personally, I don’t – but I do have a field with the opportunity to change the runs my birds use. It is useful if you have a fixed run. I would follow the manufacturer’s recommendations or use it at least during warmer weather (worm eggs cannot mature below 10 degrees Centigrade). 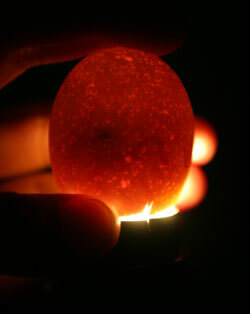 Chicken’s are 10wks old can they be given Layers pellet’s with Flubenvet. No, they are too young for Layers Pellets – these contain a lot of calcium that can harm them. Are you sure they have worms? It’s unlikely at this age. I would buy a worm testing kit (Westgate Labs produce one) and have a sample tested. I have had my 12 week old girls for 2 weeks. One of them has very sloppy droppings. How old do they have to be to worm them? I’m not sure that they have ever been wormed and should they have any sort of injections? It’s unlikely to be worms at such a young age, unless they have been kept on well used ground. There are other causes of loose droppings too – often diet can cause this if they have a sudden change. I would use a Worm Testing Kit first before worming them. 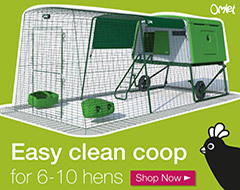 You can get these from Westgate Labs – there is a review to show you what to do on the poultrykeeper.com website. Hello Sarah, I am so saddened as this afternoon while I was giving treats to my girls one (Marmalade) had a very runny poop and something caught my eye which made me look closer, sure enough I was right it was a worm… tiny tiny worm… my poor girls, I am mortified, but have read all that you have written and will buy the Flubenvet as you suggest. It is however, bank holiday Monday (Easter) so I cannot rush out and buy wormers right away but would you suggest I pick all of their poop up from the garden where they graze (I was told to leave it as the rain washes it away… but now I am thinking it needs to be picked up) My naughty black Lab eats their poop I have caught her so as a precaution I shall worm everyone lol… I have read to check their eggs before eating them.. so that answered my egg eating question. My question is I have been worried that they have dirty bottoms… I was told the fresh lush grass would be causing that… however, I think it could be because of the worms, so would you recommend that I wash their bottoms, either now or after they have been treated with the Flubenvet… or just leave them? I don’t want to cause any distress to my girls. I feel so stupid as I am completely new to this and have only had them 3 weeks. I also think because I have seen a worm, that it is quite an infestation so I will re-use the Flubenvet in three weeks. Yes, dirty bottoms in chickens can be caused by worms. I would worm them first, then if they are in a mess, you could wash them. Worms shouldn’t cross to other species so your Labrador should be fine. Hi am trying to worm my six chickens but they won’t eat the pellets as been brought up on mash. I have taken all other food away apart from the petrels but worry they are going to be hungry how else can I worm them ? You could crush the pellets so they look more like a mash? Keep them hungry and remove all other feed and treats whilst worming them. 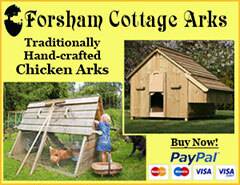 Hi, I have a selection of hens, standard reds, and some old english game birds. They have all intergrated well, i also had a cockrel but i unfortunately found him dead the other day, he was rather ‘hen pecked’! I have a question; my older hens eat layers, and my game birds successfully hatched 6 chicks, now 10 weeks, and they look after them themselves very well, another hen had chicks about week – 10 days ago and the 4 new chicks are all being very well cared for. My problem is – the chick crumb feed i put in is gobbled up by all the chickens! they love it, but it gives them a runny poo! I ve also started introducing growers pellets, which is also gobbled by ALL except the tiny chicks. Is there anything i can put in, that they can all eat safely? I don’t have facilities to remove the chicks from the hens. The way to stop the hens eating the crumbs or growers is to put a plank of wood on props about the size of a brick at each end, big enough for the chicks to walk under to get the food but not big enough for the hens to get under. Another alternative is to use a wooden ‘box’ with one side made from 1-2 inch pieces of wood spaced apart the size the chicks can fit through to go in and get the food but too small for the hens to get into. Old fashioned ‘broody coops’ had bars on the front like this that let the chicks pass through but kept the hen inside (or outside).